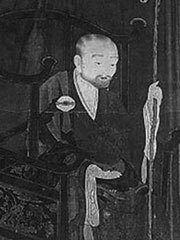 Gihwa, also known as Hamheo Teuktong (1376 — 1433) was a late Goryeo-early Joseon Buddhist monk of the Seon order, who was the leading Buddhist figure of his generation, also known as Hamheo. He was originally a Confucian scholar of the highest reputation, but he converted to Buddhism at the age of 21 upon the death of a close friend. He wandered among the Korean mountain monasteries, until he had the fortune of becoming the disciple of the last Korean National Teacher Muhak. Gihwa’s writings showed a distinctive mixture between iconoclastic and suddenistic Chan language, and a strong appreciation for the scriptural tradition. Thus, he took up from Jinul the tradition of unification of Seon and Gyo Buddhism. Among his writings, there are four works in particular that made a deep impact on the subsequent Seon tradition in Korea. These are (1) his commentary on the Sutra of Perfect Enlightenment, the Weongak gyeong hae seorui; (2) his redaction and subcommentary to five famous earlier commentaries on the Diamond Sutra, the Geumgang banyabaramilgyeong ogahae seorui; (3) his subcommentary and redaction of the Collection of Yongjia, the Yonggajip gwaju seorui and (4) the Hyeonjeong non. As a result of his fourth major work (the Hyeonjeong non) Gihwa distinguished himself as the primary Buddhist respondent to the rising Neo-Confucian polemic of his period, as he responded with vigor to the Neo-Confucian criticisms of Buddhism. He died while residing at Jeongsusa, at the southern tip of Ganghwa Island, where his tomb can still be visited. Gihwa’s commentary on the Sutra of Perfect Enlightenment was translated by Charles Muller, in 1999.